If you’re working on multiple domains, you’re sure to face issues at some point, especially in the replication process. As you know, replicating the changes made on one domain controller with all the other domain controllers in the same forest is necessary to ensure that every controller stores the same set of information. If you’re managing a large organization, you’ll often replicate within the local site as well as the additional sites to keep your data in sync across all domains and forests. This replication is important, as the lack of it can cause authentication problems. In turn, it can create problems with accessing resources on the network. By and large, Active Directory makes it a breeze to manage multiple domains. However, it throws up replication problems in many situations, and troubleshooting is surprisingly difficult. But, don’t worry! 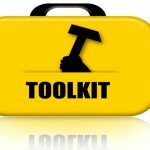 Microsoft offers a tool called repadmin that you can use to diagnose and, sometimes, even repair active directory replication problems. Repadmin is a command-line tool that’s helpful to diagnose and repair Active Directory replication problems. In fact, repadmin.exe is built into versions starting from Windows Server 2008 and Windows Server 2008 R2. It is also available if you’ve installed AD DS or AD LDS server roles. You can even access it through AD domain services tools that come as a part of the Remote Server Administration Tools (RSAT). To use repadmin, open the elevated command prompt. To open this prompt, right-click the start button and choose command prompt (admin) from the shortcut menu. And of course, you’ll have to login as the domain administrator. Next, run ntdsutil from the command prompt to start repadmin. You can do different things with repadmin. Here are some of the important tasks for which you’ll use repadmin. 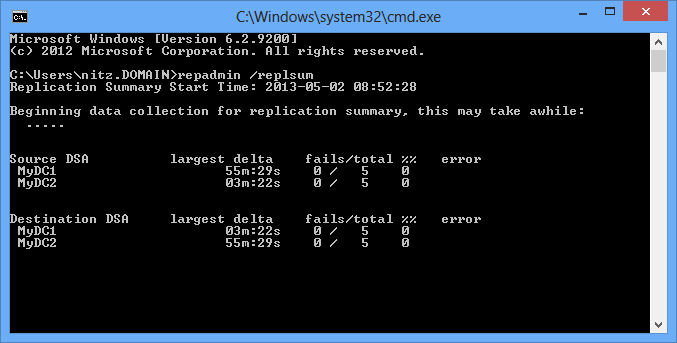 This command gets information from all the DCs and gives you a summary of every DC’s replication status. This is also the first command you should use if you’re debugging a replication problem as it gives you a snapshot of every DC’s replication status. Let’s analyze this image a bit so you know where to look for problems. Look closely and you’ll see two sections — one with source DSA and the other with destination DSA. The servers listed in both these sections are the same. So, why have these two sections then? Well, that’s because active directory updates can be written to any domain controller except read-only controllers, because it follows the multi master domain model. This means, all read-only domain controllers are listed in destination DSA only. This information makes it easy to know which are read-only controllers, and obviously, why they’re not updated. The rest of the sections tell you how many replications were attempted and the status of each attempt. 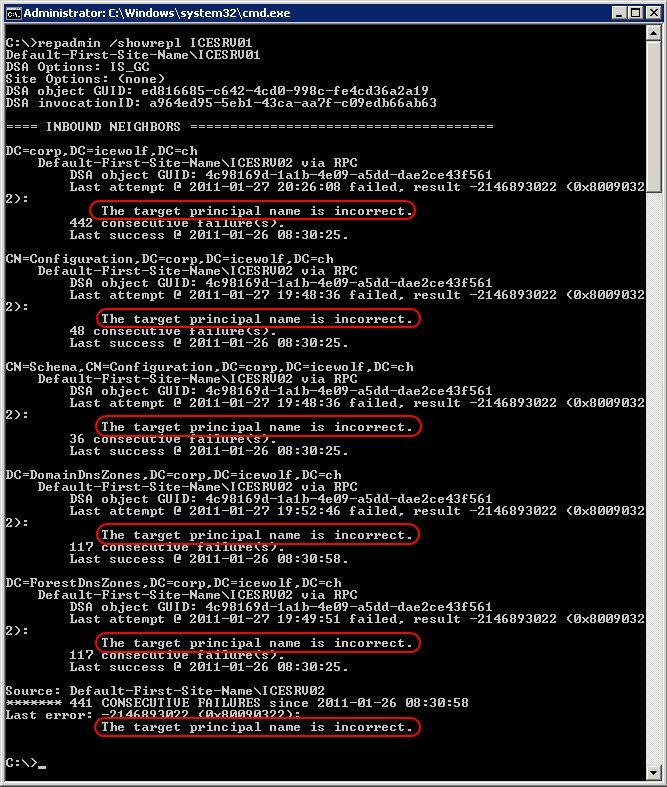 This snapshot also gives you the error percentage of replication attempts. This command will show you the likely problem for every failed attempt and can give you a better idea of what’s going on. But if you have multiple domain controllers, it can be cumbersome to look through all the details to identify the error. In the above example, the solution to the problem is to stop the “kerberos key distribution center” service. And then, restart the “Active directory domain services” service. Next, restart the replication process through Active Directory sites and services. Check your logs and the replication should be successful. Restart the “kerberos key distribution center,” if you choose to. Overall, this command gives you more insight into the problem and can point you in the right direction for a solution. This will let you if your request is in the queue. Obviously, if your request is in the queue, there’s nothing wrong with the process as such, but it can take up some more time. However, if the same items sit in the queue for an indefinite period of time or if the queue gets really long, it indicates a replication problem. In this sense, the “queue” command helps you to know if there is an error in the replication process or if your item is just sitting in the queue waiting to get executed. Besides the above three common commands, here are other choices. Running KCC on each domain controller will recalculate the inbound replication topology of that controller. Though each domain controller makes this calculation once every 15 minutes, running this command helps to troubleshoot KCC errors. At the same time, you can also evaluate if you need new connection objects. manages the password replication policy (PRP) for all read-only domain controllers (RODC). However, you’ll have to run it against a writable domain controller instead of a read-only one. This command allows you to add, remove, move, and view PRPs for any domain controller. But you can’t use this command to add or remove an account from the Deny List. Repadmin/replicate forces the replication of a directory or schema partition to all the domain controllers in the network. You’ll use this command mostly to set off AD replication for a task that you’re doing, and to check the status of replication between different domain controllers. shows the attributes of the object at that point in time. The “showattr" command uses the lightweight directory access protocol (LDAP) port 389 by default to query different writable partitions. It may also use port 3268 to query read-only partitions. Also, this command gives information such as the attribute ID, version number, timestamp, global unique identifier, update sequence numbers, and more. DSA is the host name of the domain controller. Naming context is the name of the directory partition. If you don’t specify the directory partition, it uses the configuration directory partition. /a — aborts if the server is not available. /s — does not synchronize. /q — suppresses call messages and runs in quiet mode. Thus, these are some of the options for repadmin. As you can see, repadmin.exe is a convenient tool that comes with Windows server and helps to fix replication problems that happen in Active Directory. This is a command-line tool that makes it easy to identify replication problems and fix them - something that’s not easy to do directly on AD. So, have you tried repadmin? Can you please share your experience with our readers in the comments section?